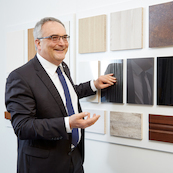 The market environment for wood and wood-based panel processing companies is becoming more complex. Securing their future competitiveness requires an agile network that delivers holistic solutions along the value chain. For HOMAG, Smart Surface Technology is the integration of various processes, machines and digital products, its own equipment and partner machinery, own expertise and external expert knowledge. Everything from a single source.